Undergrad/ Grad: PhD candidate in Anthropology with a concentration in archaeology. Former Hibben Scholar; current student volunteer. Duties: Tasks down in collections change day-to-day, so Katie’s assignments are fairly dynamic. Typical projects are: writing condition reports; pulling objects for researchers; making artifact boxes/mounts; organizing storage spaces; cataloguing and researching; assisting volunteers/students; and making trips to the off-site warehouse. While down in collections, Katie displays a wonderful balance between taking initiative and working independently and asking for guidance, which can be a tough skill to learn. Because of her excitement about working with different objects and materials, she will take a project and run with it, yet I can trust her to stop and ask for support or advice when necessary. 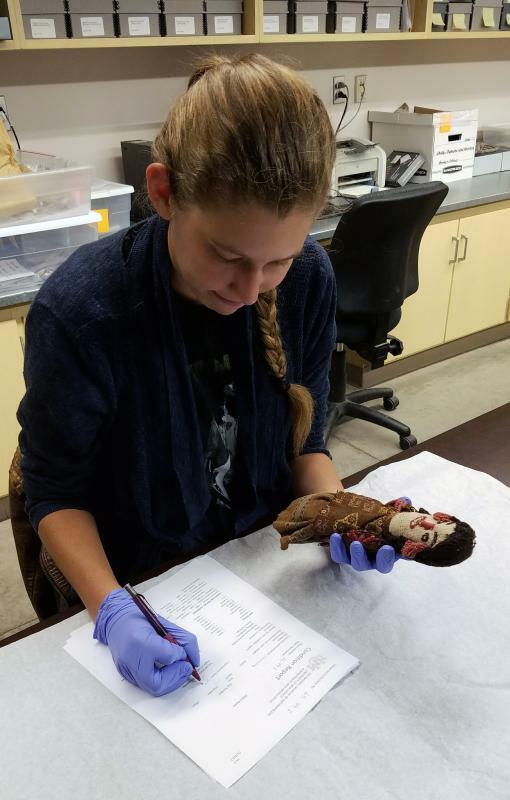 Sometimes there is no easy or affordable way to solve collections problems, so Katie often does background research in her free time and brings creative ideas to the collections spaces. Katie is also extremely patient, which has proven invaluable when she is asked to teach or assist with volunteers and other students. "Working at the Maxwell has been an amazing experience and a reminder of why I decided to pursue a graduate degree in archaeology. One of the best things about getting to work with collections is that I’ve been exposed to a wide variety of material types and have learned how to care for them. I have also had the opportunity to work with volunteers and researchers in collections. Along with the hands-on experience of collections care, my time at the Maxwell has built my confidence and helped me figure out what my ultimate career goals are.